Air Services Company has a full fleet of rental air compressors from 2HP to 300HP immediately available for rent. All electric units are self-contained and need only to be wired to your disconnect and piped to your air-line. Available 24 hours a day - seven days a week, these rental compressors are ideal for emergency breakdowns or planned preventive maintenance. To help with installation, hose and wire are available. We are proud to feature Gardner Denver Air Compressors in our Rental Fleet. Also available for rent are compressed air treatment products - air dryers, filters, aftercoolers, tanks, etc. When a contractor at the new Miller Park needed air for "tuggers" and air tools, instead of using a diesel driven portable they chose one or our Air Services Company 150HP electric units with an outdoor enclosure. The electrical unit was able to be installed on top of the stadium. The diesel unit had to have a crane bring the unit down to ground level twice a day for refueling which resulted in lost production time. 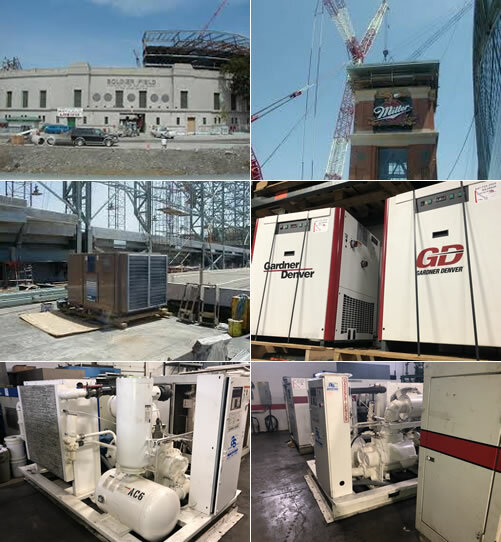 With our unit, once the machine is wired in it only requires daily inspections.Units have been rented for similar projects at stadiums, convention centers, office buildings, manufacturing facilities, anywhere compressed air is used. Air Services Company offers a variety of lease programs that we can customize to fit any compressed air requirement. Whether your plant is planning to expand in the near future and you do not want to invest in a new air system or you would like a fixed cost for your plant compressor system, an Air Services Company customized lease program will solve your compressed air problems. For a more in-depth explanation of what we have to offer, please feel free to call us or e-mail us and your territory sales representative will be happy to assist you. Whether you have an air system comprised of units over 500HP or under 20HP, having a fixed cost for your compressed air system can be an asset in many ways.